Fall for southeastern Oklahoma's many attractions, including Girls Gone Wine and Beavers Bend State Park. Fern Campground at Beavers Bend State Park aglow in the light of a fall sunset. If crisp fall afternoons and rich foliage vistas put you in the mood for a getaway, consider one of Oklahoma’s best locations for viewing fall color – the Beavers Bend area in southeastern Oklahoma. This area has long been known as a great place to enjoy Oklahoma's great fall weather by hiking, biking or horseback riding on one of the many trails or taking a drive on the Talimena National Scenic Byway. But there is a lot more to southeastern Oklahoma than spectacular fall foliage. It’s a fun weekend getaway destination that can help you relax before or after the rush of the holiday season. Whether you’re looking for a family outing, ladies-only retreat or guys’ weekend, the Beavers Bend area has it all. For those seeking a girlfriend getaway, one clear choice is Girls Gone Wine near Broken Bow. This unique attraction was created when three girlfriends decided that a winery would be a fun gathering place for groups of friends. Girls Gone Wine is more than just a tasting room; it is a fun place where you can taste, select, make and bottle your favorite wines for gifts or special occasions. Of course, you can simply select your favorite bottle of wine and be on your way to enjoy your vacation. Or you might choose to spend a little more time to make your own batch of wine, returning about eight weeks later to bottle, cork and custom label your wine. Girls Gone Wine offers a winery, tasting area and gift shop, plus a large covered patio with fire pits where you can unwind and visit while sipping your favorite boutique wine. Guys can focus their energies on a trout fishing excursion. 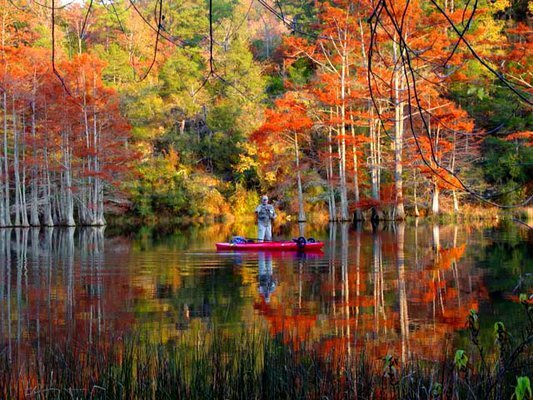 Beavers Bend State Park is an area that's abundant with wildlife, wilderness and adventure. Wade into a cool mountain stream, get the whole family hooked on trout fishing or just bond with the guys. There's a lot more to southeastern Oklahoma than spectacular fall foliage. The Lower Mountain Fork River offers year-round trout fishing throughout a 12-mile portion of the river and its tributaries from Broken Bow dam downstream to the U.S. Highway 70 Bridge. About five miles of this designated stream lies within Beavers Bend State Park. When planning a trip to the area, you’ll find there are several lodging choices. A great resource is Beavers Bend Creative Escapes. They can help you plan every detail for a fun-filled family vacation or romantic retreat. From bed and breakfasts and cabins to boating and outdoor equipment rentals, Creative Escapes can help customize your vacation in the Broken Bow area. You’ll definitely want to look into Beavers Bend State Park and Lodge. The scenic beauty of Beavers Bend State Park makes it one of Oklahoma’s most popular resort areas. The crystal-clear water of the lake and river as well as the 100-foot tall pine trees make it the perfect location for your next outing. Lakeview Lodge within the park is a wonderful place to stay where each room has a balcony view over Broken Bow Lake. Be sure to rise early and gaze over the lake as mist shrouds the lake below you and gently lifts as the sun rises to unveil the blue waters. There are also a variety of cabins, some with decks and views over the Mountain Fork River. Much of the charm of Beavers Bend State Park lies in the fact that when the park was built in 1937 by the Civilian Conservation Corps, the materials of choice came from the land itself: slabs of native stone and hardwood timber from the area were used. From those materials CCC crews fashioned cabins, staircases, fireplaces, campsites and even the Forest Heritage Center and Museum, which now doubles as the Beavers Bend State Park office. The beauty of Beavers Bend State Park is that you are free to explore on your own or join in group activities – or to try a little of both. Visitors can participate in eagle watches from November through February, trout fishing, guided horseback rides on scenic trails or hayrides through the park. A year-round naturalist and a well-stocked nature center make for an event lineup that includes campfire programs on the banks of the Mountain Fork River, nature hikes, arts and crafts classes and nature films. In the park’s Riverbend area, water lovers can find yakanoes (a combination kayak and canoe), paddle boats, canoes and sandy beaches with roped-off swim areas. The clear waters of the 14,000-acre Broken Bow Lake are also a favorite haunt of scuba divers. Other park diversions: golfing, miniature golf, tennis, jet skiing (rentals available), bumper boat rides, boating (party barge rentals available) and canoeing (rentals available). Beavers Bend resort park also draws serious hikers. The David Boren Hiking Trail offers 16 miles of hiking trails with four miles of multipurpose (mountain bike) trails that wander along ridge tops, over creek bottoms, through tall stands of timber and into areas so remote one can almost experience what early-day explorers must have felt upon seeing the Ouachita National Forest for the first time. Good news for the not-so-serious hiker: the same trail can also be divided into a variety of short and long hikes. With all of this activity, you’re bound to work up an appetite. Try Abendigo’s Grill and Patio north of Broken Bow where they're known for “creative casual cuisine with a new American twist.” With a constantly evolving menu and a fun-yet-relaxing atmosphere, customers leave full and happy, then return again and again. Abendigo’s prides itself on great-tasting food and live music, which make for a lively casual dining experience. So call your friends or check the family calendar and set a date for your fall getaway to southeastern Oklahoma. It’s sure to be a memorable trip that may even spark an annual tradition.